Arthur was born in March 1895, one of six children. Arthur’s parents were Arthur and Annie Blackman. He lived with his family at 40 A O’Neill St Ponsonby, Auckland, New Zealand prior to his leaving home and moving to New Plymouth, New Zealand. Arthur’s occupation was a warehouseman Arthur had previously served in field ambulance. 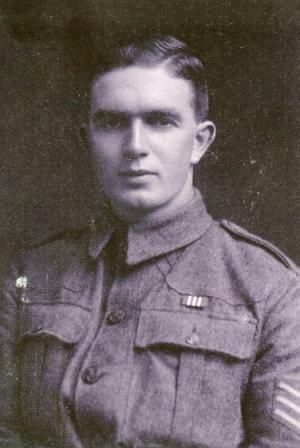 Arthur Blackman enlisted on the 30th April 1915 embarking from Wellington, New Zealand, with 1st Battalion NZ Rifle Brigade. Arthur disembarked in Egypt on the 15th November 1915, leaving for France in April 1916 and arriving in France in late June 1916. The battle of Flers-Courcelette, 15-22 September 1916, was the third main phase of the Battle of the Somme. It is best known as the first tank battle in history, as it featured forty nine Mk I tanks. Some of the tanks supported the New Zealand Division's attack towards the village of Flers. The battle of Flers-Courcelette was New Zealands first major engagement on the Somme in 1916. It was during this battle that Sergeant Arthur Blackman was award the Military Medal for Gallantry (MM) on the 18th October 1916 for “Bravery and the cool and capable manner in which he directed the linking up of shell holes on the right of the line held by the 1st battalion 3rd NZ Rifle Brigade north-east Flers on the afternoon of 15th of September 1916”. On the 16th April 1917 Arthur was promoted to a Warrant Officer Class II. On the 25th September 1917, Arthur was promoted to the rank of Second Lieutenant. Arthur returned to NZ on the 2nd October 1917. He was ordered to return to the front line of the Western Front on 14th February 1918, leaving for France for the second time on 15th May 1918. Arthur re-joined his battalion on the 11th August 1918, arriving in Etaples, France on 18th August 1918, returning to the front line with his battalion on 29th August 1918.